This is one of the best pizzas I have ever made and one of the prettiest, too. Oh and this is coming from a has been/maybe still am tomato hater. I don't know what it is about it, but the flavor combination of this pizza still has my mouth watering. 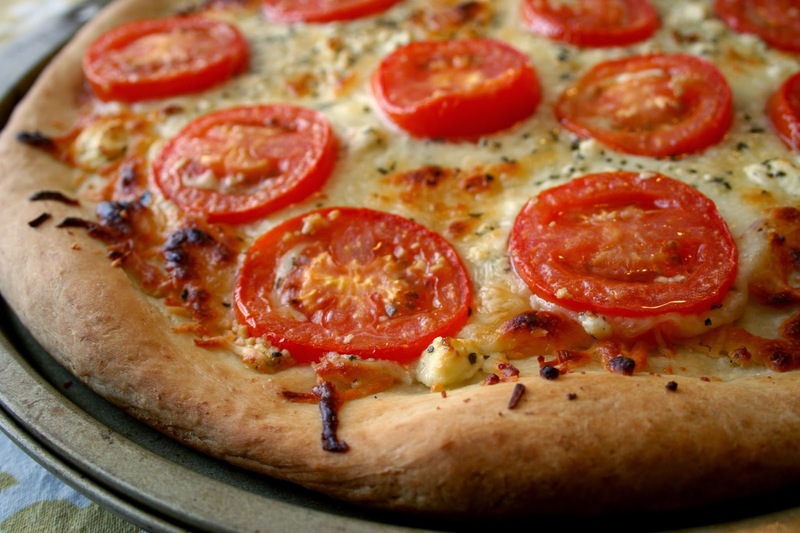 You'll be surprised to know that this pizza doesn't have an actual sauce, just a garlic oil base under a layer of 3 cheeses and garlicky tomatoes. It is so good that I made it twice in 2 weeks. It's one of those beautiful things I never would have expected. Again, coming from a tomato hater. 2. Prepare pizza dough and spread into greased pizza pan. 3. Bake for 3 minutes to avoid a soggy crust. 4. Stir together olive oil, garlic and salt; toss with tomatoes. Let marinade for 15 minutes, but no longer than 20 minutes. 5. 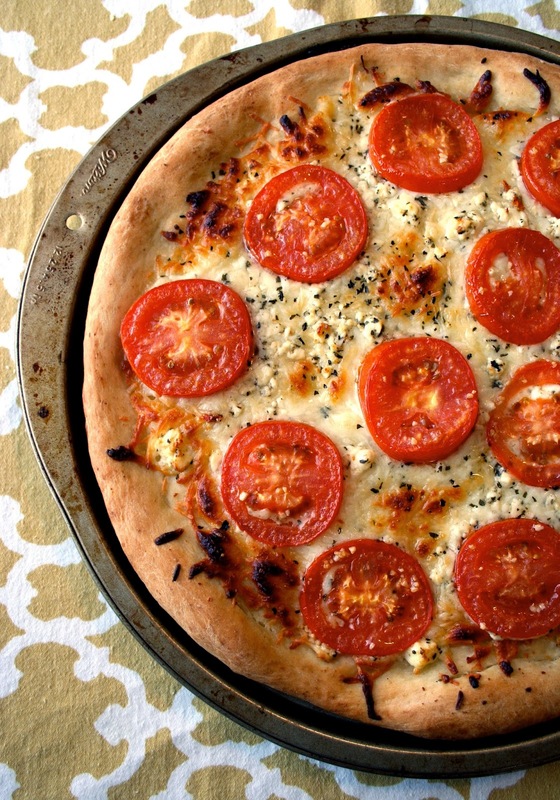 Brush pizza crust with tomato marinade. 6. Sprinkle pizza with mozzarella, parmesan and feta cheeses. 7. Place tomatoes on top of cheeses and sprinkle basil evenly on top. 8. Bake pizza for 15 minutes and enjoy! 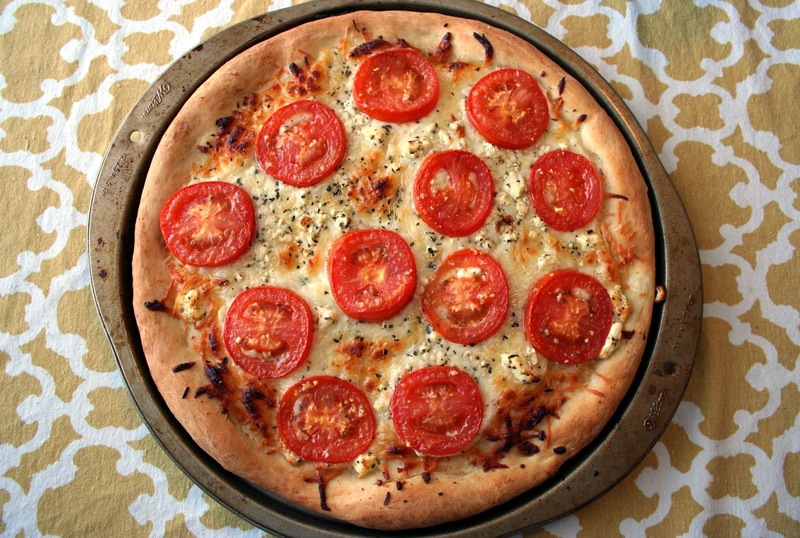 I'm a tomato hater too, but this pizza looks and sounds good. I sometimes like tomatoes when they are cooked, so I will have to try this! I don't know what it is, but I can eat cooked tomatoes on pizza. Maybe because it hides the texture?? Haha. You should try it out and let me know how you like it! Tomato pizzas are my absolute FAVORITE. :) I must try this recipe too! If you love tomatoes then this is right up your alley!